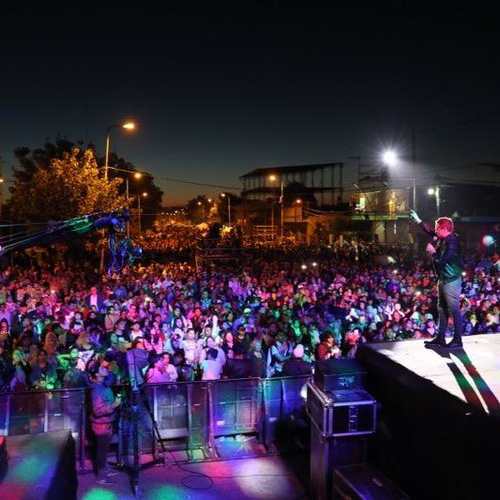 Evangelist Andrew Palau shared the Gospel with a receptive crowd in the Argentina city of Jose C. Paz during a November 16-17 music festival that unified 140 churches, trained 2,000 believers in personal evangelism, and reached more than 19,000 people in person. In addition to those reached in person, 31,000 people from around the world watched the festival online, reported Palau’s organization, the Luis Palau Association. By the end of the weekend, more than 1,400 people reportedly had made public confessions of faith in Jesus. “The harvest continues in Latin America,” reported Palau in a video message. Organized by the local evangelical community and supported by 140 local church congregations, the festival in Argentina was built on decades of committed ministry in Latin America from the Palau Association. While association founder Luis Palau faced consistent opposition when he first started preaching the Gospel on the streets of his hometown in Argentina six decades ago, the Palau Association reported a dramatic change in the receptivity of the Gospel and the growth of the Church in recent years. A highlight of this festival was a service project earlier in the week in partnership with Samaritan’s Feet. Focusing on the children of the community, the Palau team hosted a gathering on the Thursday before the festival where disadvantaged and underprivileged children could get their feet washed and receive a new pair of shoes. As the volunteers washed the children’s feet, they shared the Gospel with them and invited them into a relationship with Jesus Christ. As a result of that outreach alone, 76 children accepted Christ. The next festival with Palau will take place in Abidjan, Côte d'Ivoire, West Africa, February 16-18, 2019. Palau will also travel throughout the United States and to Europe, Latin America, and China to lead outreaches in several additional cities at the beginning of the New Year. To view the association’s upcoming events, visit www.palau.org/news/upcoming-events.